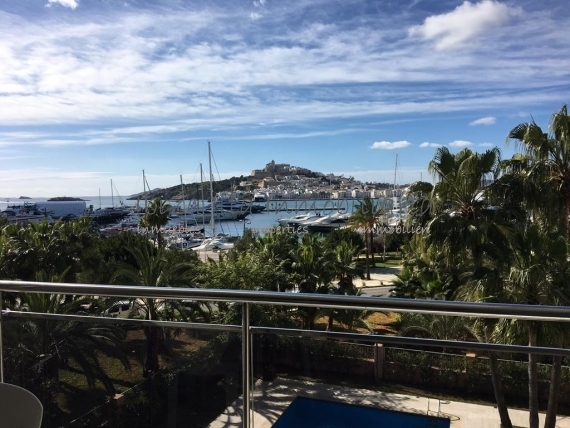 This spacious apartment is located in front of the promenade of Ibiza on a high floor of a modern building. Its surface is distributed in 3 bedrooms and 3 bathrooms, 2 en suite. A large living room with modern open plan kitchen and a laundry-storage room. From any corner of the front room we have views of the marina and the old town, Dalt Vila. A terrace of approx.15m2 invites us to relax and enjoy the views. The white marble floors enhance the feeling of spaciousness in a property that already has a big constructed area. The building has 2 swimming pools. Covered parking space included in price.